For the video game, see F355 Challenge. The Ferrari F355 (Type F129) is a sports car manufactured by Italian car manufacturer Ferrari produced from May 1994 to 1999. The car is a heavily revised Ferrari 348 with notable exterior and performance changes. The F355 was succeeded by the all-new Ferrari 360. Apart from the displacement increase from 3.4 L (3,405 cc) to 3.5 L (3,495 cc), the major difference between the V8 engine in the 348 and F355 is the introduction of a 5-valve cylinder head. This new head design allowed for better intake permeability and resulted in an engine that was considerably more powerful, generating a maximum power output 380 PS (279 kW; 375 hp) at 8,250 rpm and 363 N⋅m (268 lb⋅ft) of at 6,000 rpm. 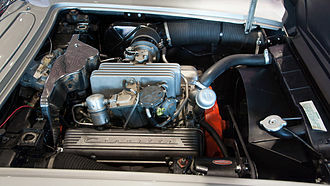 The longitudinally mounted 90° V8 engine was stroked by 2 mm over the 348's engine (77 mm rather than 75 mm), resulting in the small increase in displacement. Engine internals are produced using lightweight materials; the connecting rods are forged in Ti6-Al-4V titanium alloy. The engine's compression ratio is 11:1 and employs the Bosch Motronic 2.7 engine control unit in the 1995 model year, later changed to the M5.2 in 1996 through end of production. The Motronic system controls the electronic fuel injection and ignition systems, with a single spark plug per cylinder. Engine lubrication is via a dry sump oiling system. The frame is a steel monocoque with tubular steel rear sub-frame with front and rear suspensions using independent, unequal-length wishbones, coil springs over gas-filled telescopic shock absorbers with electronic control servos and anti-roll bars. The car allows selection between two damper settings, "Comfort" and "Sport". The road-going models came with Pirelli tyres, size 225/40ZR 18 at the front and 265/40 ZR 18 at the rear. Although the F355 was equipped with power-assisted steering (intended to improve low-speed drivability relative to the outgoing 348), this could optionally be replaced with a manual steering rack setup by special order. Aerodynamics for the car included over 1,300 hours of wind tunnel analysis. The car incorporates a nolder profile on the upper portion of the tail, and a fairing on the underbody that generates downforce when the car is at speed. The car's standard seats are upholstered with hides from Connolly Leather, and are fitted asymmetrically in the car; this results in the driver being slightly closer to the car's center line than the passenger. At launch, the only model available was the Berlinetta (coupé version) priced at US$130,000 (£78,000). The Spider (convertible version), priced at US$137,000 (£82,500) and the GTS (targa top model) were introduced in 1995. In 1997, the Formula One style paddle shift electrohydraulic manual transmission was introduced, with the model equipped with the new transmission being called the Ferrari 355 F1 (note the dropping of the F before the 355) adding £6,000 to the dealer asking price. The F355 was the last in the series of mid-engine Ferrari models with the Flying Buttress rear window, a lineage going back to the 1965 Dino 206 GT, unveiled at the Paris Auto Show. The nomenclature does not follow the formula from the previous decades, i.e., engine capacity (in litres) followed by number of cylinders (e.g. 246 = 2.4 liters, 6 cylinders, 308 = 3.0 liters, 8 cylinders, etc.). In naming the F355, Ferrari used engine capacity followed by the number of valves per cylinder (355 = 3.5 litres engine capacity and 5 valves per cylinder) to bring the performance advances introduced by a 5-valve per cylinder configuration into the forefront. The Berlinetta was introduced in May 1994, as the first in a successful series of F355 models. Initially, the 6-speed manual was the only transmission available. However, in 1997, the Berlinetta was the first-ever road car to be equipped with the innovative F1-style gearbox management system. Derived directly from Formula 1, where it made its debut in 1989 resulting in a win at the Brazilian Grand Prix, the electro-hydraulic system was operated by paddles behind the steering wheel using the F355's conventional 6-speed manual gearbox. The new transmission guaranteed faster gear changes, with the additional advantage that both of the driver's hands could stay on the wheel at all times. Ferrari produced 4,871 road-going Berlinetta models during the entire production run, of which 3,829 were equipped with the 6-speed manual and 1,042 with F1 transmissions. The F355 Spider debuted in 1995, its Pininfarina-penned lines honed by 1,800 hours in the wind tunnel, resulted in a blend of elegant style and aerodynamic performance. For the first time on a Ferrari automobile, the semi-automatic soft-top was powered electronically. Initially, the Spider was offered with the 6-speed manual transmission. In 1997, the Spider was offered with the F1 transmission available as an option. 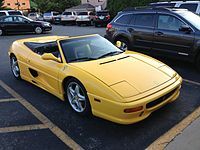 The Spider proved to be the second-most popular F355 model, with a total production of 3,717 units, of which 2,664 were produced with the 6-speed manual transmission and 1,053 were produced with the F1 transmission. In 1995, Ferrari introduced the GTS model to the F355 family. The GTS model was based on the Berlinetta but offered a removable "targa-style" hard top roof, which could be stored behind the seats. 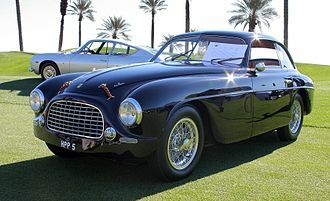 Other specifications were identical to the Berlinetta. A total of 2,577 GTS models were produced, with 2,048 delivered with the 6-speed manual transmission and another 529 with the F1 transmission. This was the last production targa body style model produced by Ferrari until the La Ferrari Aperta. In 1995, Ferrari introduced a race-ready F355 Challenge model for use specifically in the Ferrari Challenge race series. The Ferrari F355 Challenge model was developed by starting with a standard Ferrari F355 Berlinetta and modifying it with a US$30,000 factory-to-dealer supplied kit. The initial 1995 cars came with factory fitted cage mounts and without carpets. Each year, the cars arrived with more and more factory fitted race parts, culminating in 1998 with full-evolution cars which were supplied as virtually complete race cars except of some parts such as the rear wing, which still needed to be fitted by the dealer. The F355 Challenge shares the same engine and physical dimensions as the standard F355 Berlinetta. 108 cars in total were produced, all of which were equipped with the 6-speed manual transmission. Although some sources indicate that over 300 cars were subject to the Challenge conversion, yet this claim remains unproven. There were 18 RHD cars imported by Ferrari UK and modified by MHT. A further 10 were sold to the rest of the RHD markets. Making the total number to only 28 RHD models. These RHD models become extremely rare and valuable. Some of these rare cars are located in Indonesia, Australia, Japan and only one known example in South Africa. Each F355 Challenge has an emblem on the rear that specifically denotes 'F355 Challenge'. There were 100 Serie Fiorano units delivered to the U.S. market, 74 with the F1 transmission and 26 with the 6-speed manual. An additional 4 units were produced beyond the planned production for the U.S., with only 3 European models and one unit destined for South Africa. The American units were delivered with a numbered plaque affixed to the dashboard while the 3 Fioranos delivered to Europe had no numbered plaque. Total production of 11,273 units made the F355 the most-produced Ferrari at the time. This sales record would be surpassed by its successor, the 360 and later, the F430. In November 2009, Ferrari recalled about 2,400 1995–99 355s and 355F1s in the United States because of improperly placed screw clamps that could damage the fuel-supply pipes and allow fuel to leak into the engine compartment. Ferrari learned of the problem when it was sued over a fire involving an injury to a driver. ^ a b c d e Alfieri, Bruno (1998). Ferrari F355. Automobilia. ISBN 88-7960-087-7. ^ Pund, Daniel. "Inside Line: News, Road Tests, Auto Shows, Car Photos and Videos". Edmunds.com. Retrieved 2009-11-25. ^ "Ferrari.com - F355 Spider". ferrari.com. Retrieved 2010-03-16. ^ "1996 Ferrari F355 Challenge". conceptcarz.com. Retrieved 2007-09-01. ^ "Ferrari F355 Challenge - European Super Car". motortrend.com. Retrieved 2010-03-16. ^ "1999 Ferrari F355 Spider Serie Fiorano". Retrieved 12 January 2019. ^ a b Covelllo, Mike (2003-06-01). Standard Catalog of Ferrari 1947-2003. Krause Publications. ISBN 1440227969. ^ a b c d e "Ferrari.com - F355 Berlinetta". ferrari.com. Retrieved 2010-03-16. ^ "ferrariworld.com/Cars/Yesterday/F355 GTS". 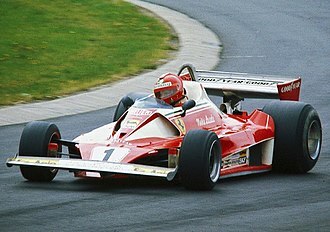 ferrariworld.com. Retrieved 2007-09-01. 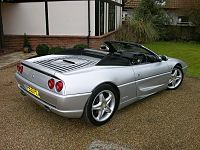 ^ "Ferrari F355 Archived Test – Review – Car and Driver". Car and Driver. Retrieved 2018-02-11. ^ Jensen, Christopher (November 27, 2009). "Ferrari's Unusual Recall". The New York Times. Wheels (blog). 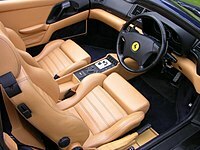 Wikimedia Commons has media related to Ferrari F355. 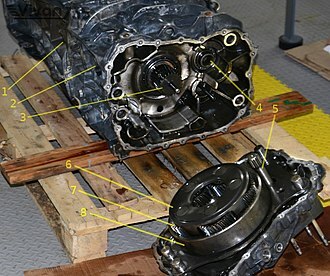 In a reciprocating piston engine, the connecting rod or conrod connects the piston to the crank or crankshaft. Together with the crank, they form a mechanism that converts reciprocating motion into rotating motion. Connecting rods may convert rotating motion into reciprocating motion, before the development of engines, they were first used in this way. As a connecting rod is rigid, it may transmit either a push or a pull, earlier mechanisms, such as chains, could only pull. 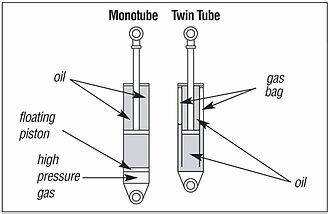 In a few two-stroke engines the connecting rod is required to push. Today, connecting rods are best known through their use in internal combustion piston engines and these are of a distinctly different design from earlier forms of connecting rods, used in steam engines and steam locomotives. The earliest evidence for a connecting rod appears in the late 3rd century AD Roman Hierapolis sawmill and it appears in two 6th century Eastern Roman saw mills excavated at Ephesus and Gerasa. The crank and connecting rod mechanism of these Roman watermills converted the motion of the waterwheel into the linear movement of the saw blades. In Renaissance Italy, the earliest evidence of a − albeit mechanically misunderstood − compound crank, a sound understanding of the motion involved is displayed by the painter Pisanello who showed a piston-pump driven by a water-wheel and operated by two simple cranks and two connecting-rods. 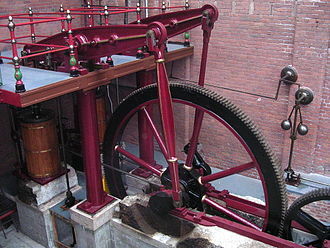 The first steam engines, Newcomens atmospheric engine, was single-acting, its piston only did work in one direction and their output rocked back and forth, rather than rotating continuously. Steam engines after this are usually double-acting, their internal pressure works on each side of the piston in turn. 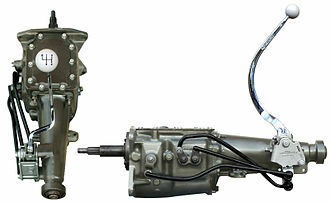 This requires a seal around the rod and so the hinge between the piston and connecting rod is placed outside the cylinder, in a large sliding bearing block called a crosshead. In a steam locomotive, the pins are usually mounted directly on one or more pairs of driving wheels. The connecting rods, run between the pins and crossheads, where they connect to the piston rods. Crossheads or trunk guides are used on large diesel engines manufactured for marine service. The Dino 206 GT,246 GT and 246 GTS are V6 mid-engined sports cars produced by Ferrari and sold under the Dino marque between 1968 and 1974. The Dino 246 was the first Ferrari model produced in high numbers and it is lauded by many for its intrinsic driving qualities and groundbreaking design. 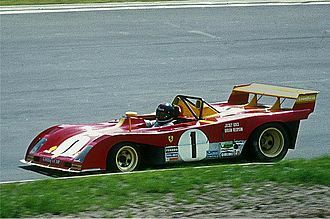 In 2004, Sports Car International placed the car at number six on its list of Top Sports Cars of the 1970s, motor Trend Classic placed the 206/246 at number seven in their list of the 10 Greatest Ferraris of all time. The production Dino 206 GT was designed by Leonardo Fioravanti at Pininfarina, the 206 GT used a transverse-mounted 2.0 L all-aluminum,160 hp at the 8,000 rpm redline, 65-degree V6 engine with dual overhead camshafts and a 9.7,1 compression ratio. Torque was 138 lbs/ft at 6,500 rpm, the crankshaft featured four main bearings. Induction was via three Weber 40 DCN/4 2-barrel carburetors and it was the first Ferrari product to have a direct rack-and-pinion steering. 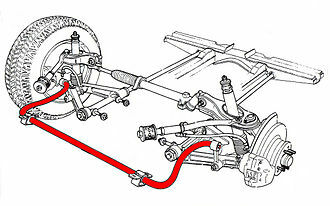 The 206 GT frame featured a light-weight,1980 pound, aluminium body, full independent suspension, the 206 GT had a 90. 0-inch wheelbase. The 206 had a top speed of 146 mph,152 were built in total during 1968 and 1969, in left hand drive only. The same 2. 0L engine was used in the Fiat Dino Coupe and Spider, the conversion of the Dino 196 racing engine for road-going use in the Dino was entrusted by Fiat to Aurelio Lampredi, to whom Ferrari owed so many great engines. Lampredi, interviewed in the early 1980s, noted that, Things didnt work out exactly as Ferrari had foreseen, Ferrari had counted building the engines at Maranello, but Fiats management insisted on taking control of production, to avoid any breaks in the engine supply. Fiat quoted 160 hp DIN for the Fiat Dino and Coupé and this, was not the case. Both engines were made by Fiat workers in Turin on the production line, without any discrimination as to their destination. 150 units were taken from the first production batch at the beginning of 1968 to power the Dino 206 GTs. Jean-Pierre Gabriel, writing in Les Ferraris de Turin, notes that, however, as always, it was certainly a savvy piece of marketing by the Commendatore. The widest application for spark ignition internal combustion engines is in petrol road vehicles, four-by-fours, pickups, vans and buses. Compression ignition Diesel engines ignite the mixture by the heat of compression. They usually have glowplugs that preheat the combustion chamber to allow starting in cold weather, other engines may use a flame, or a heated tube, for ignition. While this was common for very early engines it is now rare, the first electric spark ignition was probably Alessandro Voltas toy electric pistol from the 1780s. The simplest form of ignition is that using a magneto. The spark plugs are connected directly from the magneto output, early magnetos had one coil, with the contact breaker inside the combustion chamber. 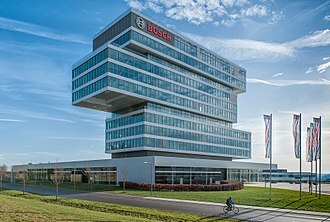 In about 1902, Bosch introduced a double-coil magneto, with a fixed sparking plug, and they are used on piston-engined aircraft engines. Although an electrical supply is available, magneto systems are used mainly because of their higher reliability, magnetos were used in these engines because their simplicity and self-contained operation was more reliable, and because magnetos weighed less than having a battery and dynamo or alternator. The Wright brothers used a magneto invented in 1902 and built for them in 1903 by Dayton, Ohio inventor and this gave the benefits of easy starting with reliable sparking at speed. Many modern magneto systems have removed the second coil from the magneto itself, in this development, the induced current in the coil in the magneto flows through the primary of the external coil, generating a high voltage in the secondary as a result. Such a system is referred to as a transfer system. Energy transfer systems provide the ultimate in ignition reliability, the output of a magneto depends on the speed of the engine, and therefore starting can be problematic. 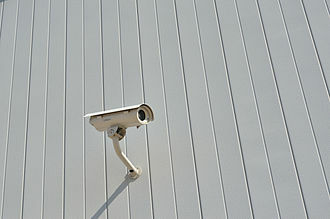 Some magnetos include a system, which spins the magnet quickly at the proper moment. 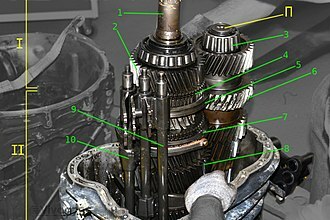 Some engines, such as aircraft but the Ford Model T, used a system which relied on non rechargeable dry cells, the operator would manually switch the ignition over to magneto operation for high speed operation. To provide high voltage for the spark from the low voltage batteries, a tickler was used, in this mode of operation, the coil would buzz continuously, producing a constant train of sparks. Switchable magneto ignition circuit, with starting battery.